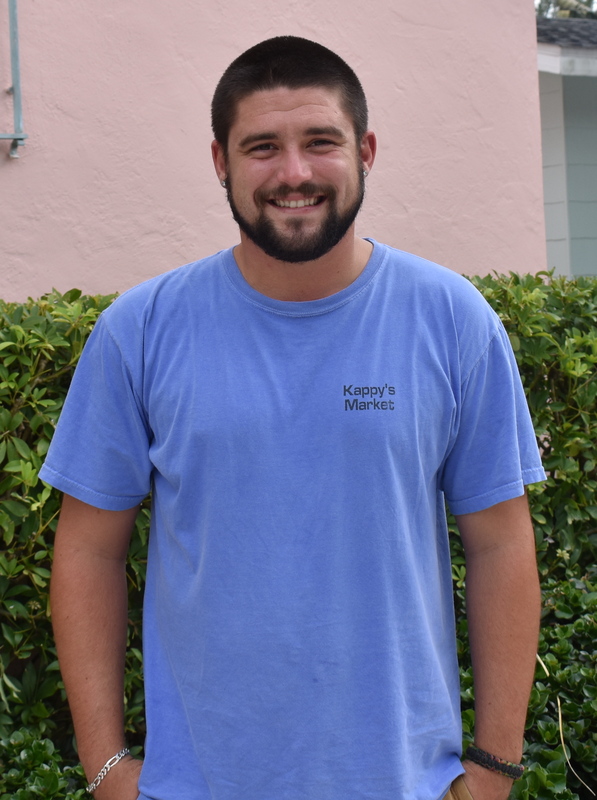 Andy Charcut was living in Illinois in 2013, when his boss Steve Kaplin, offered him a job in Boca Grande. At the time, Steve owned Infotrack, a pre-employment screening company. Steve and his wife Jill were vacationing in Boca Grande when they noticed that an island convenience store was for sale. Intrigued by the thought of retiring in Florida, they made a spontaneous decision to purchase Kappy’s Market (formerly Gill’s Grocery) on the north end of the island. Steve offered Andy a job at the store, and with the cold winter approaching, Andy immediately accepted. He had been on several vacations with his family to Florida before, but he wasn’t familiar with Boca Grande. “When Steve called and told me he needed some help running the business I told him my bags were already packed,” Andy said. Andy is from a suburban town called Wadsworth, which is a village in Lake County, Illinois, near the Wisconsin border. After graduating from high school, he attended college for a while at Benedictine University and eventually decided to accept a full-time job. He was a pizza delivery guy for a while and also worked as a baseball umpire before he started working at Infotrack. Andy was a football quarterback and a baseball player in high school. In general, he is a fan of all sports. He attended the same high school as his fiancée, Joree Greene. Although they didn’t really know each other very well in school, they reconnected through mutual friends a few years later. It also happened to be at the same time as he was planning his move to Florida. Coincidentally, Joree had just graduated from college with a business and marketing degree and was planning to move to Fort Myers to search for jobs in the area. She currently works for the Ford dealership in Englewood. Once they realized how close they’d be living to each other, they decided to start dating. “It’s kind of funny how it happened – it’s a small world,” Andy said. They have been together for four years, and Andy proposed to Joree last New Year’s Eve. They will be getting married on June 9, 2018 at the Lehmann Mansion in Lake Villa, Illinois. The home was constructed in 1912 by the Lehmann family, who were very influential to that area in the early part of the last century. “It’s a popular wedding destination, and most of our friends and family live in that area, so we figured it would be easier to have the wedding there,” Andy said. The bride and groom will be flying up to Illinois next June along with a few members of the wedding party. Andy’s parents, Peter and Jill, presently live in Illinois. He has a younger brother, Cory, who also lives up north. Andy said his dad was very supportive of his decision to move to Florida. Since then, he said his parents have enjoyed coming down during the winter to visit. He is glad he accepted the opportunity and said it has been a great learning experience to watch the business grow since 2013. There are currently about six employees who work regularly at the store, and more who help out during the busy season. He said other popular purchases at the store are the fresh deli sandwiches that are made to order and the premium Working Cow ice cream, a Florida-based homemade gourmet ice cream brand. They are also slowly introducing more clothing and jewelry items to the inventory as well. When they first moved to the area, Andy and Joree rented an apartment above the The Inn Bakery on the island for two years. They currently live in Rotonda West with their cat, Fortune, a young kitty they rescued when they moved here. Andy also has a dog, Bentley, a chocolate Lab that lives with his dad in Illinois. Peter has brought Bentley down to visit Andy on several occasions, and the dog gets along well with Fortune. When Andy is not working, he enjoys golfing, fishing and watching all kinds of sports. He often fishes from the pier at the north end of the island, and he’s looking forward to eventually participating in a tarpon tournament. Joree is currently learning the game of golf, and they’ve been practicing a lot together at courses around the area. Andy has been golfing for several years, and he used to play every summer in Illinois. When he can’t play sports, he enjoys following the games on television and hanging out with friends. 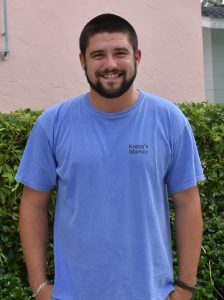 He said his favorite part about working in Boca Grande is getting to know all the people and watching the business grow. “I like being able to make changes to the inventory and seeing what new things our customers are interested in buying,” he said. He said the person he admires the most in life is his father. Andy said he is very happy living in Florida, and he plans to stay here in the future. Andy and Joree are planning to go back home for a visit around the holidays this November, and then they’ll head back up for their wedding next June. Kappy’s Market is located at 5800 Gasparilla Road. The store is open seven days a week and stays open on all major holidays. The next time you’re headed to Kappy’s to grab a sandwich or some cold ice cream, look for Andy in the store and say hello.